Home » General Health » Folate vs. Folic Acid: What’s the Difference? My friend Rebecca is pregnant. She is having her first child, and it’s an exciting time; however, there are a few extra vitamins she has to take. In particular, her doctor prescribed vitamin B9. When it comes to vitamin B9, there are two choices—folate and folic acid. Although the difference between folate and folic acid is important to distinguish, many health practitioners, nutrition experts, and medical professionals often mix up the two vitamins since the terms are often used interchangeably. In fact, many health professionals often believe folate and folic acid are the same nutrient. Rebecca certainly wanted to know whether to take folate or folic acid. Needless to say, Rebecca was confused and needed answers. Not just for her health, but for the health of her baby as well. Is folate and folic acid the same thing? It is important to be aware of the difference between folate and folic acid since they do affect your health in different ways. Let’s take a brief look, and break down folate vs. folic acid to help distinguish between the vitamins. Folate is the natural form of the water-soluble vitamin B9. The name folate had previously been called folacin. The importance of folate should not be understated. It is responsible for several important bodily functions. For instance, folate is crucial for the formation of DNA and cell growth. In the digestive system, most folate is converted into the active form of a vitamin called 5-methyltetrahydrofolate (5-MTHF), before it enters into the bloodstream. It is also called levomefolic acid or methylfolate. Folate is also important for red blood cell development, nervous system function support, and preventing the buildup of the amino acid homocysteine in the blood. Folate is known to aid many health conditions, including general or muscular fatigue, depression, irritability, mental fatigue, forgetfulness, confusion, insomnia, and gingivitis or periodontal disease. According to the Institute of Medicine at the National Academy of Sciences, 400 micrograms (mcg) of folate is recommended for people 14 years and older. It is found naturally in food such as fruits and vegetables. Is folate and folic acid the same thing when it comes to supplementation? Folate is also considered a general term that could describe folic acid. However, folic acid is the oxidized synthetic version of vitamin B9 that is commonly found in dietary supplements and fortified foods like breakfast cereals and flour. Folate is only considered half available as folic acid since it contains a polyglutamate structure. Hence, synthetic folic acid is also called pteroylmonoglutamic acid. Folic acid was once thought to absorb better than natural folate, but studies have found that a whole foods, folate-rich diet is just as effective. 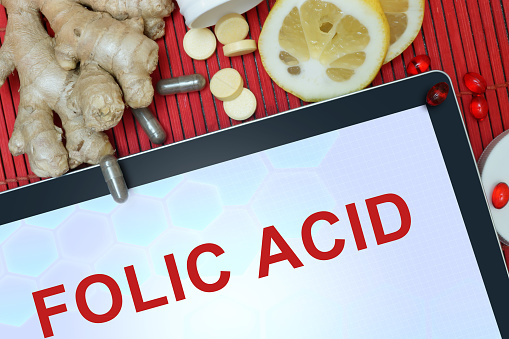 Most folic acid cannot be converted to the active folate 5-MTHF, and instead it is converted in the liver, or other tissues. The process is very slow and takes some time. It is even worse when fortified foods and folic acid supplements are consumed together. This can lead to unmetabolized folic acid in the bloodstream, and various health problems such as an increased risk of cancer and an undetected vitamin B12 deficiency. Luckily, there is natural folate supplementation available called L-5-methyltetrahydrofolate (L-5-MTHF). A natural folate supplementation can also be taken in conjunction with food sources of folate. It is estimated that 85% of folate supplementation is bioavailable when taken with food, but only 50% of folate is bioavailable with just food. Natural folate food sources are also about 80% more bioavailable than synthetic folic acid. The name folate is taken from the Latin word “folium.” It means “leaf.” It is not a surprise that leafy vegetables are by far the best sources of folate. Folate is found naturally in various leafy vegetables such as spinach, cabbage, turnip greens, collard greens, and romaine lettuce. Other vegetables with high folate include okra, asparagus, broccoli, artichoke, Brussels sprouts, beets, potato, celery, cauliflower, summer squash, bell peppers, green peas, and winter squash. Fruits high in folate include papaya, tomatoes, and avocado. Other good food sources include green beans, pinto beans, black beans, lima beans, chickpeas, navy beans, lentils, calf’s liver, chicken’s liver, and other animal livers. Low levels of folate are linked with a higher risk of various health conditions. For example, high homocysteine is linked with an increased risk of stroke and heart disease. Folate deficiency is also connected with cancer risk, including stomach, cervical, pancreatic, colon, or breast cancer. Folate deficiency can also increase the risk of second heart attacks, depression, memory and mental agility problems, allergic diseases, male fertility, and lower bone density. Folate deficiency is also linked with anemia, especially when an individual doesn’t get enough natural folate foods. Folic acid deficiency anemia is also linked with sickle cell disease. The anemia may also develop when the person has a problem absorbing folate due to improper kidney function or alcohol abuse. Medications that treat seizures, cancer, arthritis, and rheumatoid arthritis may also increase the risk for folic acid deficiency anemia. Symptoms related with folic acid deficiency anemia include weight loss, loss of appetite, irritability, forgetfulness, general weakness, and fatigue or tiredness. Deficiencies in other B vitamins can also lead to folate deficiency, including low levels of vitamin B1, vitamin B2, and vitamin B3. Poor protein intake, heavy alcohol consumption, excessive coffee drinking, and smoking can also contribute to folate deficiency. Other symptoms related with folate deficiency include depression, insomnia, confusion, general or muscular fatigue, diarrhea, and gingivitis. Folate is a particularly important nutrient for women before conception and during pregnancy. Higher amounts of folate food or L-5-MTHF supplementation are necessary during pregnancy and for lactating women. Women of childbearing age should get 400 mcg of natural folate daily. It is recommended that women get 600 mcg during pregnancy, and lactating women get 500 mcg of folate each day. In pregnant women, folate deficiency is linked with birth defects such as neural tube defects (NTD). As mentioned, folate is very important in DNA formation and cell growth, which is why the nutrient is necessary during pregnancy. Folate can also help lower the risk of premature birth, low birth weight, cleft lip and palate, miscarriage, and other pregnancy complications. Folate will also help support the nervous system and red blood cell development for the mother and fetus. It is also important to know the difference between folate and folic acid in relation to pregnancy. Folic acid will not cross the placenta to the fetus in the same way as the active folate from food or L-5-MTHF. Seniors are also deeply at risk for folate deficiency. Folate and homocysteine deficiency associated with poor cognition in the elderly. Dementia in old age is also linked with diminishing cognitive function like memory problems. A high intake of folic acid can also mask vitamin B12 deficiency. It can also lead to central nervous system function deterioration in seniors. Seniors should increase their folate intake to reduce the risk of heart disease and stroke. Folate supplementation can also slow the progression of age-related hearing loss in the elderly with low dietary folate and high homocysteine levels. It is generally recommended that older adults aged 51 or older get 400 mcg of dietary or supplemental folate daily. Vitamin B9 is a very important nutrient for health, but it is also vital to know the difference between folate and folic acid and that there may be potential side effects from excessive folate and interactions with medications. Although rare, some side effects of high doses of folate include seizures, nausea, loss of appetite, confusion, skin reactions, sleep problems, and stomach problems. Very high doses of folate at 1,000 to 1,200 mcg daily can trigger nervous system-related symptoms such as intestinal dysfunction, malaise, irritability, and insomnia. Also, certain medications are known to interact with folic acid supplements, including the antibiotic tetracycline, phenytoin, pyrimethamine, chemotherapy medications, antacids, H2 blockers, proton pump inhibitors, bile acid sequestrants, anti-seizure drugs, non-steroidal anti-inflammatory drugs (NSAIDs), sulfasalazine, triamterene, cycloserine, methotrexate, and trimethoprim. Winkles, R.M., “Bioavailability of food folates is 80% of that of folic acid,” American Journal of Clinical Nutrition, 2007; 85(2): 465-473; http://www.ncbi.nlm.nih.gov/pubmed/17284745. “Vitamin B9 (Folic acid),” University of Maryland Medical Center web site; https://umm.edu/health/medical/altmed/supplement/vitamin-b9-folic-acid, last accessed November 18, 2015. “Folate,” National Institutes of Health Office of Dietary Supplements web site; https://ods.od.nih.gov/factsheets/Folate-HealthProfessional/, last accessed November 18, 2015. “Food Sources of Folate,” Dietitians of Canada web site, February 25, 2014; http://www.dietitians.ca/Your-Health/Nutrition-A-Z/Vitamins/Food-Sources-of-Folate.aspx. Kresser, C., “The Little known (but crucial) difference between folate and folic acid,” Chris Kresser web site, March 9, 2012; http://chriskresser.com/folate-vs-folic-acid/. Arnarson, A., “Folic Acid vs Folate – What’s the Difference?” Authority Nutrition web site, http://authoritynutrition.com/folic-acid-vs-folate/, last accessed November 18, 2015.